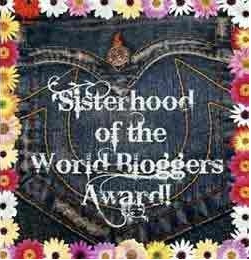 I was nominated by my dear friend and sister blogger Bridget Lappert from Broke But Bougie for the Sisterhood of the World Bloggers Award. Once blogging partners and college roommates, we tackled the blogosphere documenting our post-grad lives and shared our tips and tricks for living on a budget. Check her out! She has a knack for finding quirky and classy outfits and writes in a way that will make you feel like you just found your virtual best friend. Thanks for nominating me, girl! Put the award logo on your blog post. Favorite item in your wardrobe? Currently, it's a sweatshirt I got from Oak Hills Breaking Co. It's way comfy and I love a good piece of clothing you can lounge in or rock in public. Three things you love about yourself? My ability to be empathetic toward others. My ability to laugh at myself. My ability to craft a story. Hard question! I'll go with currently - Parks and Rec. Three things every woman should have in their closet? A statement handbag. A pair of flattering jeans. Something that makes you feel beautiful - a classic watch, bold lipstick, something leopard or something bodycon. Trend you're afraid to try? Milkmaid braids. I just can't. As a challenge for myself. I've always loved to write, and I've blogged before, but I never stuck with them. I was never truly happy with what I was doing, because I was too caught up in analytics and getting recognized. When I left my job to have and take care of our new little girl, I promised myself I'd start writing for myself and not stop. Someone you'd love to collaborate with? Item you're saving up to buy? I'll be honest - an area rug. 2) Which actress would play you in a movie? 4) Favorite room in your home and why? 7) Biggest lesson you've learned thus far? 8) Your favorite place to go to get inspired? 9) How did you meet your best friend?